Nestled between the rugged Lost Coast and the majestic redwoods of Northern California, The Victorian Village of Ferndale is one of California's best preserved 19th century towns. Built on the wealth of the area's early dairy farmers, remarkably the town has survived changing economies and time, and remains a vital, working village. Not only has the town's Main Street survived , but the surrounding countryside boasts many fine examples of gingerbread Victorian homes. Park your car to step back in time. Enjoy magnificently preserved Victorian architecture as you stroll; pick up visitor information from any shop. On the National Register of Historic Places, and voted America's Best Painted Town, Ferndale's Main Street is a photographer's paradise and a shopper's delight. Silva's Fine Jewelry sits at the end of Main Street in the Victorian Inn, Ferndale's largest and most spectacular commercial building. Explore the old-fashioned mercantiles, antique stores, art galleries, and specialty shops. Listen to the clip clop of the horse-drawn carriage, go into a shop where saddles are still handmade, and talk with the friendly people. Watch fresh candy being dipped by hand to whet your appetite for a fine dinner and an evening at the repertory theatre. Resting by the fire in your elegant bed and breakfast inn, think about tomorrow: a walk along nearby coastlines, a nature hike in Russ Park (the 110-acre forest bird sanctuary), a boat tour of the Eel River Delta, a visit to the museums, a leisurely day filled with old-fashioned service and friendly faces. You will find a town where the old way of life has not been compromised. The splendid buildings have been carefully restored, embellished with lovingly-tended gardens, and people take the time to smile a friendly greeting. Although it's been suggested that the Victorian village is a fairytale setting, Ferndale is a working, all-American town which takes pride in its beautiful community and cultural heritage. In the late 1800s Ferndale was an agricultural and transportation center, a melting pot for Scandinavian, Swiss-Italian, and Portuguese immigrants. The entire village is California Historical Landmark No. 883. There's nothing stodgy in this small town, though; Ferndale loves to have fun! 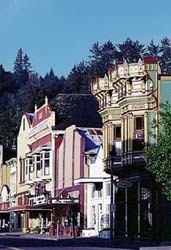 It is home to many colorful events and festivals: Victorian Village Mysteries, Foggy Bottoms Milk Run, Tour of the Unknown Coast bicycle run, Portuguese Holy Ghost Celebration, Scandinavian Mid-Summer Festival, the Humboldt County Fair, Victorian Village Oktoberfest, and the Christmas Lighted Tractor Parade, to name just a few. The cradle of the wild and whacky Kinetic Sculpture Race, Ferndale continues to host the finish of this off-beat art event, now a three-day contest. Christmas in Ferndale is magical. Children from the elementary school decorate Christmas trees in front of Main Street shops and merchants host a Hospitality Night open house, serving up cheer to friends, neighbors, and guests. The repertory theatre presents a holiday classic for the whole family and members of the volunteer fire department hang more than 900 lights on a huge Sitka spruce at the end of Main Street for the lighting of America's tallest living Christmas tree. 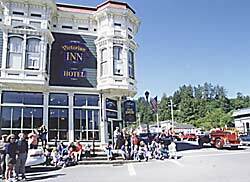 The Victorian Village of Ferndale, full of surprises, deserves more than a day to discover. From California Highway 101, take the Fernbridge/Ferndale exit. Cross historic Fernbridge and drive through five miles of pastoral views to Ferndale's Main Street.